I want to share with you some genius level work by Phil Quinn (blog | twitter), who is furthering the boundaries of SQL Server. 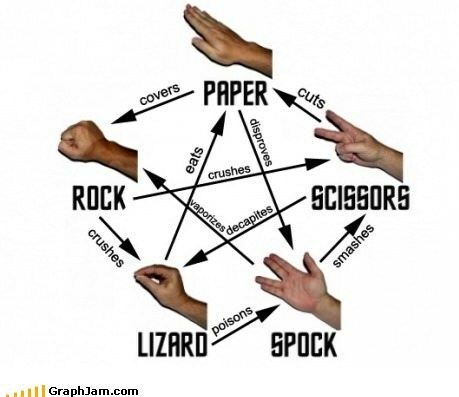 Phil has taken the spatial drawing code from an earlier Frog-blog and used it to create a fully functional Rock Paper Scissors Lizard Spock game, just using the power of SQL Server. Not even the brightest boffins at Microsoft could ever have imagined that SQL Server would be able to provide such an awesome service to the World.